My first entry to Weekend Loafer in August 2011 was the quintessential French sourdough- Pain au Levain from Daniels Leaders’ Local Breads…and by coincidence I will end the year with Pain au Levain — but this time from Jeffrey Hamelman’s Bread: A Baker’s Book of Techniques and Recipes. As I have baked this recipe many times before with great success, I thought I might try and guild the lily by adding a little twist to the recipe. A search of my box of flours in the pantry produced a half bag of some bio spelt flour, some sesame seeds so I did some quick calculations … and off we went. After the autolyse I added the levain and salt, but the dough was too stiff probably because the hydration was a little off for a Pain au Levain (must have been the thirsty spelt flour). So I incorporated a little extra water as I kneaded the dough in order to bring it to a workable soft consistency. 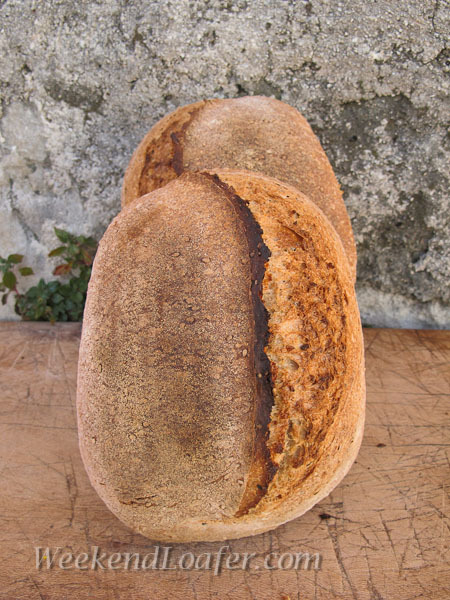 The shaping and proofing went according to plan, but when I turned out shaped loaves and slashed them, they did not hold their shape and had a rather low profile. Nonetheless, I slid them onto the hot baking stone, into a steamy oven and they underwent their trial by fire. 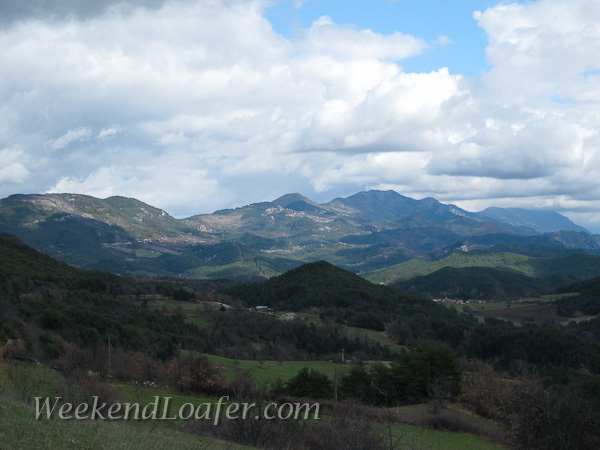 As there was nothing I could do at that point but cross my fingers and hope for a good oven spring, I went outside to sit in the warm late noon winter sun and take in the view of my valley. The anticipation was too much to take, so I peeked into the oven — and a big smile came upon my face. My fears of finding flat pancakes evaporated. The loaves had sprung up and showed a great exterior color. But the proof was in the tasting! 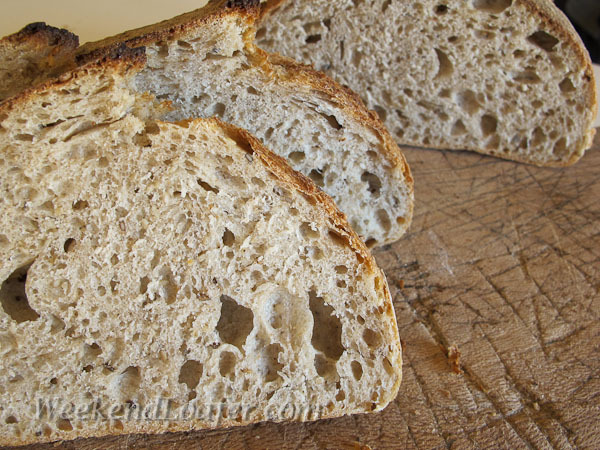 I have become a big fan of using spelt in my sourdough breads. The spelt imparts a rich subtitle nutty taste that is really hard to describe. And the combination of the sesame seeds and spelt is a truly winning combination. But the next time I make this great bread I think I’ll roast the seeds beforehand instead of soaking them for an even richer overall flavor. The night before take your levain out of the refrigerator, weigh out the appropriate amount of starter and mash the levain with a whisk in a bowl with the water. Add the flours and stir with a spatula until it comes together. Turned out onto the work surface and knead to incorporate the flours. 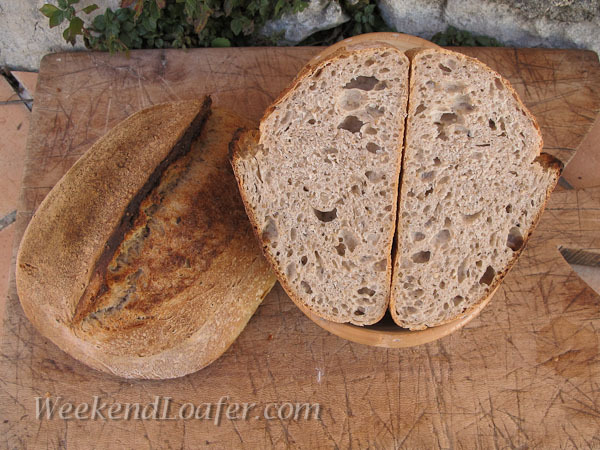 Place the Levain in a covered container and let it sit at room temperature (70°) for 12 hours. After you prepare the Levain place the sesame seeds in a bowl with the water to cover and tightly cover. Kneading By hand: Turn the dough out onto your work surface. (I had to add a small amount water to achieve the desire consistency) I flatten the dough into a large rectangle; smear the Levain on top of the dough. With floured or oiled hands knead a few strokes to fully incorporate the starter, flatten out the dough again and evenly disperse the salt and continue kneading for 12 to 15 minutes. I use a combination of the French kneading technique (video) and this method if the dough is really wet (video) to start. For the first couple of minutes it will be a sticky mess on your work surface, but do not yield to the temptation of adding more flour. Stop occasionally and use your bench scraper to gather any stray dough off of your work surface and ceiling. Continue until you have a good gluten development. You should be able to gently stretch a piece of the dough into a thin membrane that you can almost see through without it tearing. Place the seeds on a towel to remove excess water. At this time add the soaked seeds. I add them at the end of mixing to prevent the sharp grains from ripping the gluten structure. Knead the seeds into the dough till evenly distributed. By machine: Add the salt and Levain and mix the medium speed until the dough cleans up the bowl and you reach a good gluten development. Add seeds on low speed the last minute or so. Divide into two equal pieces and lightly pre-shape into a boule or log shape. Lightly flour the dough, cover and let rest for 10-15 minutes. Shape each piece of dough into a batard or an oval or boule and place seam side up on a floured couche or into floured bannetons. Cover with a plastic bag or plastic wrap and proof at room temperature for 2-2 1/2 hours. (76°) When you press your floured finger into the dough, the indentation will spring back slowly.